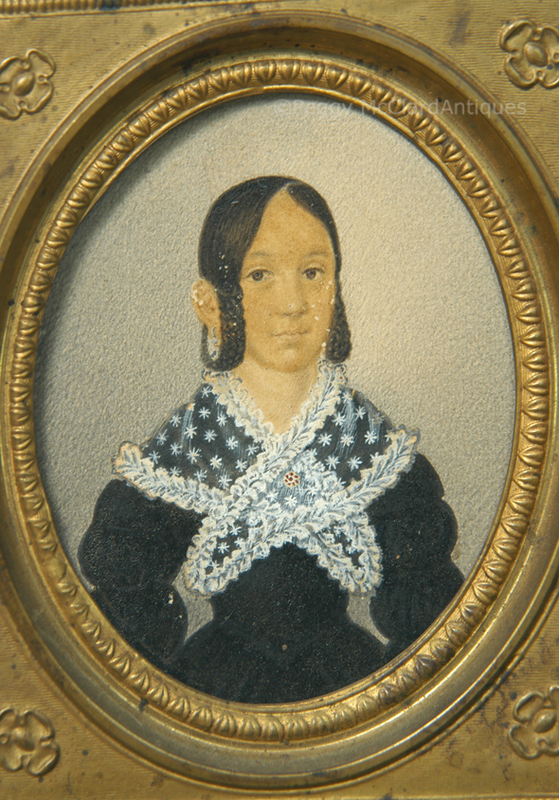 19th century portrait miniature on paper of a young woman who looks to possibly be Native American. She wears a black dress which shows styles from a couple of different decades, perhaps the mark of homemade clothing that takes from styles she has seen in the past. Her sleeves are of the “Marie” style which were full all the way down but gathered at intervals with ribbons. These sleeves were popular in the 1820s. A similar sleeve style of the 1830s was known as en bouffant but it was a bit different than this—generally gathered in only a couple of places where as the “Marie” was gathered quite a few times down the entire length of the arm. The dress has dropped shoulders covered by mancherons (an ornamental group of flounces at the head of the sleeves and, in this case, covering the top of the sleeves). The dropped shoulder became fashionable about 1836 while mancherons were popular from 1817 until sometime in the 1830s. The young lady’s waist is adorned with a dip in the bodice, which became popular around 1833. She also wears a translucent lace pèlerine clasped by a brooch which appears to be of gold and a group of red stones (possibly garnets). She also wears earrings which appear to be hoops (we can only see one) inset with small dark stones with a blue stone (possibly turquoise) at the bottom of the hoop. The young woman’s hair is parted, starting a front center then moving to her left so that the part appears to be quite off-center. She wears it pulled down from the part, to the front of her ears where a braid starts on each side. Each braid drops from the start, looping to the back of her head just behind the ears. Except for the off-center part (which I’ve never seen in the 19th century), braids which loosely circled the ears was fashionable in the 1840s. However, the off-center part, the long braids of very straight black hair, the dark complexion and the dark brown eyes lead me to think that the lady is possibly Native American. The mixture of styles from different decades also helps form my opinion that the clothes are likely made at home by a woman of rather modest means. The portrait resides in its original stamped brass over wood spandrel frame with a brass hanging loop. Framed size is5 ¼” x 4 ½”. There are some small spots of paint loss as can be seen in the photos. 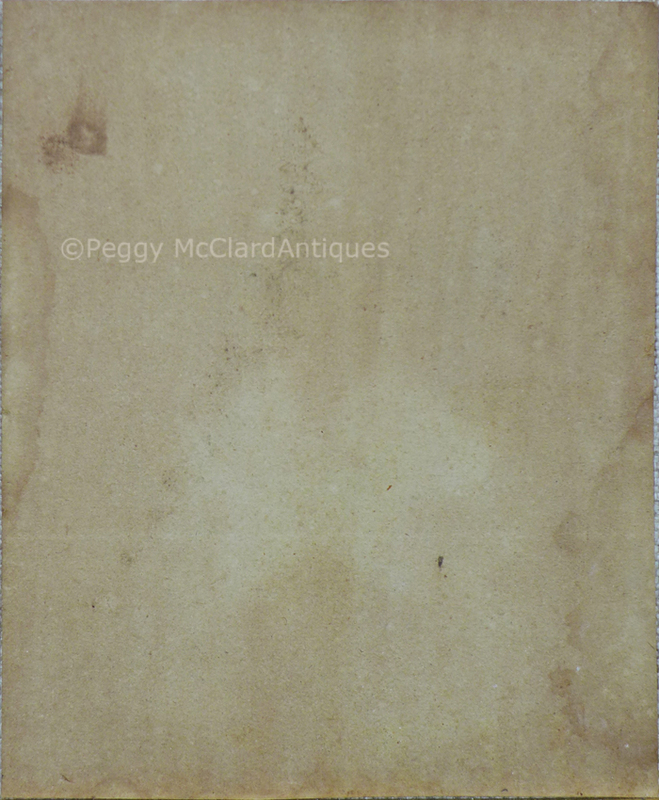 The back of the paper has appropriate ghosting to authenticate the artwork. 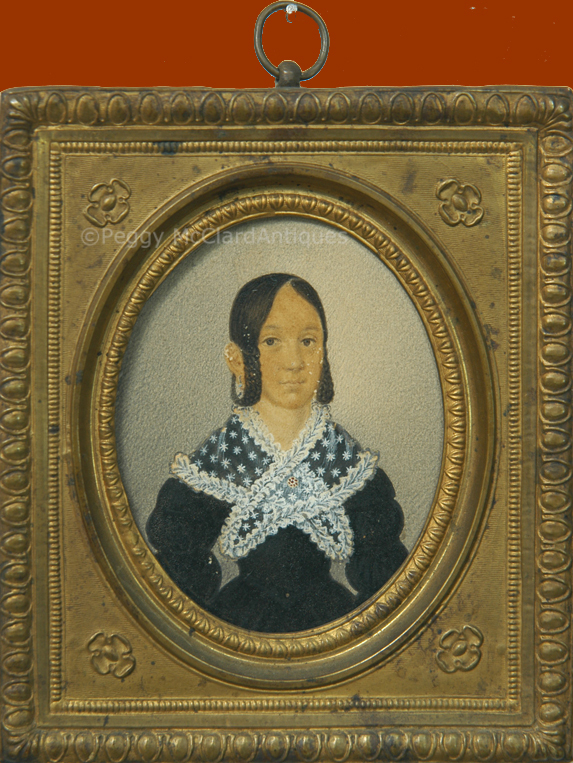 I must date it from the latest style I see, which is the braids encircling her ears—circa 1840. 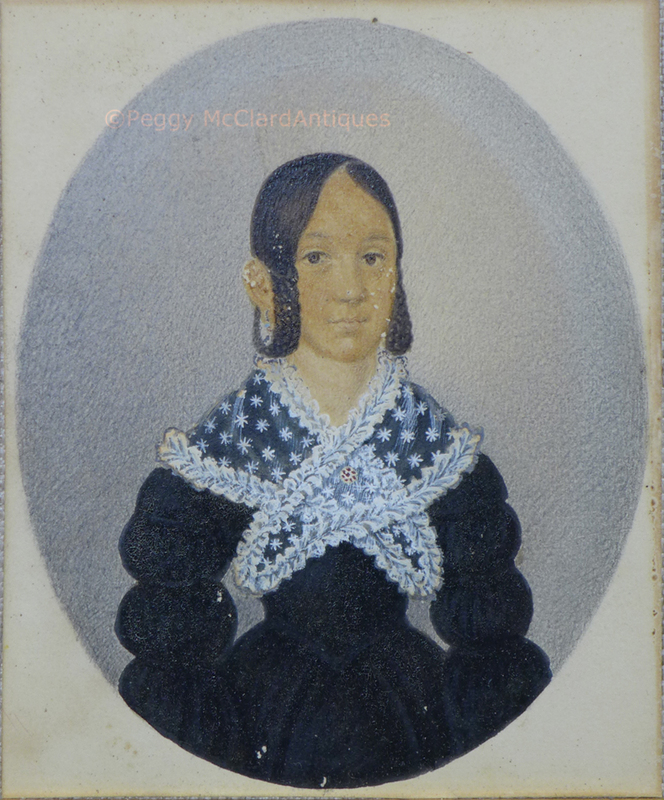 It appears that this portrait miniature has been stored out of the light for a very long time. The colors are very vibrant and there is very little UV damage. This is a really great and unusual piece of American folk art.